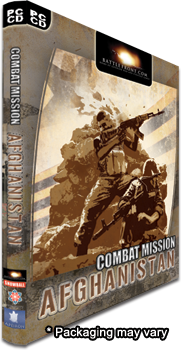 Battlefront released the latest title in its excellent Combat Mission series, Combat Mission Afghanistan. CM:A covers the original Soviet invasion of Afghanistan at a squad level. There is a demo available (353MB). The Armchair General has an interview with the designer. Combat Mission Afghanistan covers two periods of the Russian-Afghan wars – the initial phase 1980-1982, and the later years of highest activity 1985-1987 – in two campaigns and additionally ten standalone missions. The fully featured editor will of course allow players to create all new custom maps and missions. Players are able to take command of Soviet or DRA (Democratic Republic of Afghanistan) Army units as well as mujahedeen guerrilla forces. This entry was posted in Computer Wargames, Modern, News and Updates.